⚡ See an expert's vision of contact between humanity and an extraterrestrial life form. The ‘aliens’ in Contact are my favourite film depiction of aliens, hands down. If you’re watching Cosmos, then Contact is the perfect accompaniment to the series. The original Cosmos was created by Carl Sagan, who also wrote the book that Contact is based on. While Cosmos gives you the concrete science behind what we know about the Universe, Contact gives Sagan’s vision of our first contact with extraterrestrials. 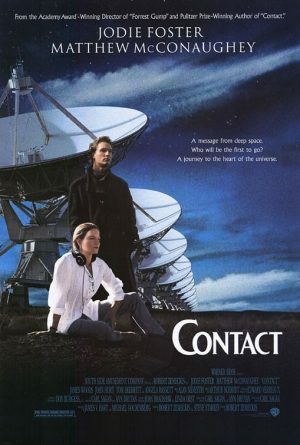 Jodie Foster and Matthew McConaughey are great. Things take a little while to build up… but when they do, it’s worth the wait.